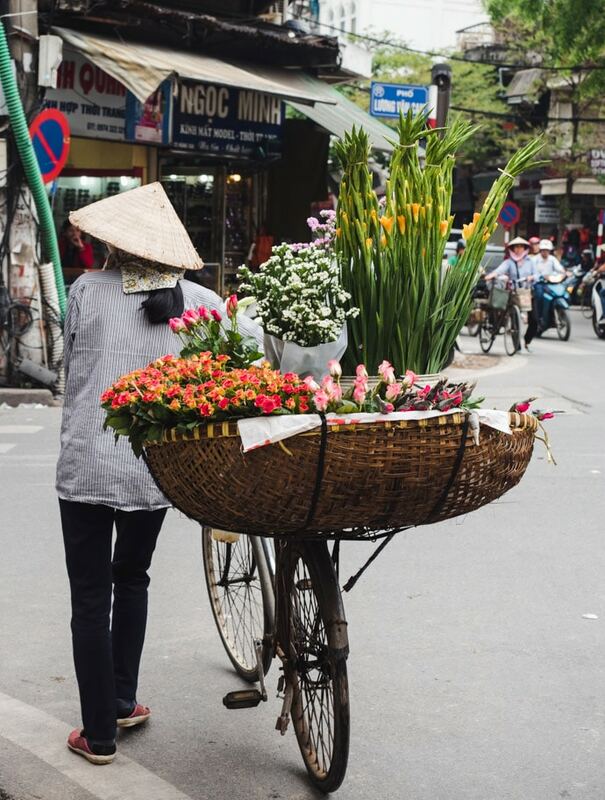 If you’re thinking about visiting Vietnam, your trip to Vietnam will be filled with friendly people, stunning natural scenery, delicious Vietnamese food, Vietnamese Iced Coffee, so much history, and you will get to experience their vibrant culture. We’ve spent over 6 months in Vietnam and love this incredible country. Deciding where to go in Vietnam is perhaps the hardest part of planning your trip because there are so many amazing places to see in Vietnam. So to help you choose, here are our picks for the best places to visit in Vietnam. What Is The Best Time To Visit Vietnam? 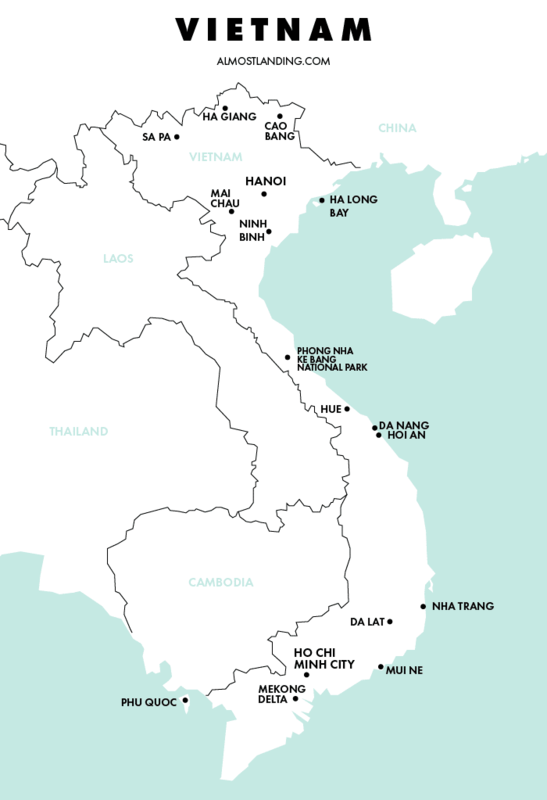 Here is a map of Vietnam so you can visualise all of the best places to visit in Vietnam and use it to plan your Vietnam itinerary. I’m going to put it out there. Hoi An is the best place to visit in Vietnam. In my opinion. But first, let me give you some background. So Hội An is located along the central coast of Vietnam. 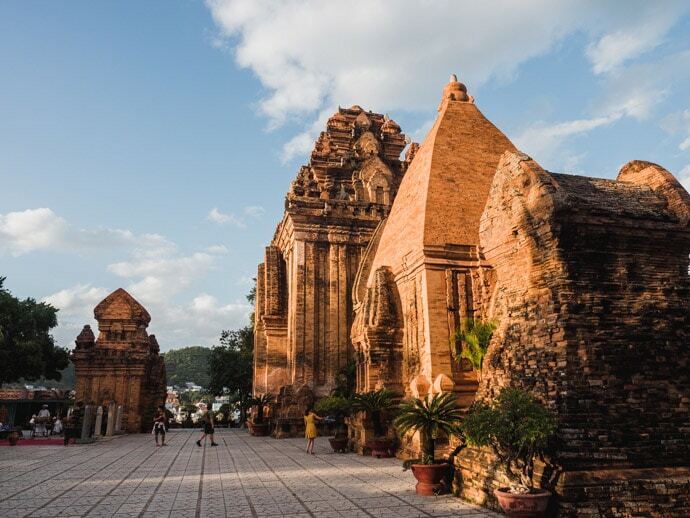 Vietnam is a long country, so that makes Hoi An easy to incorporate into a Vietnam Itinerary whether you have decided to visit north, south or the entire length of Vietnam. 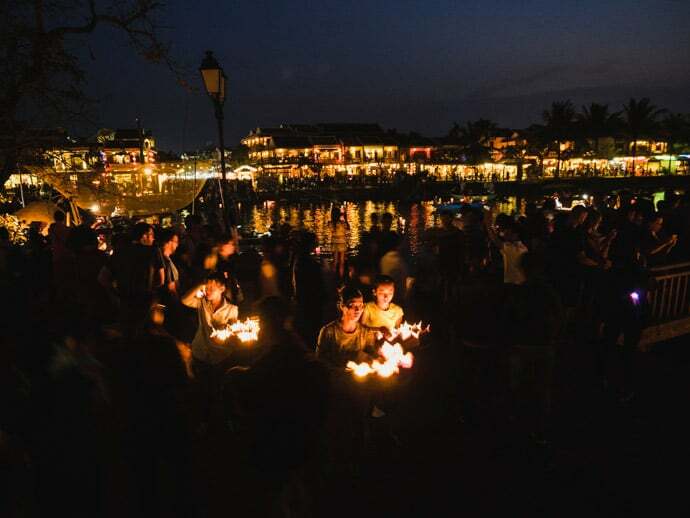 Hoi An is most known for its ancient town along the river, a beautiful town filled with yellow buildings side by side and lanterns lighting up the streets. 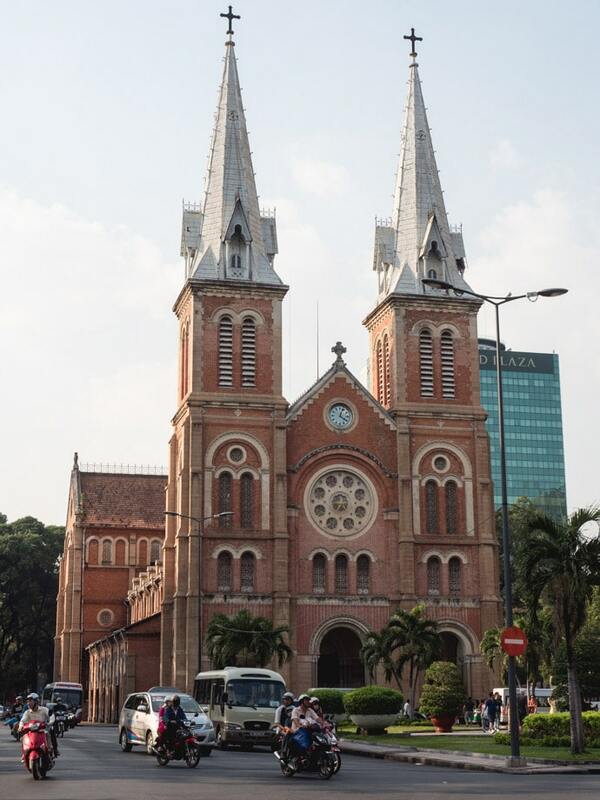 Here you will find incredible architecture, reflecting Vietnamese, Chinese, French and Japanese influences. Although admittedly, the Ancient Town can get very busy, especially at night, it still has a charm that you can’t ignore. But Hoi An is so much more than it’s ancient town, from exploring the beautiful rice fields that surround it, Cam Nam Island, Herb Village and An Bang Beach. In Hoi An, you can really experience so much, whether you like the beach, ancient towns or tranquil rice fields. And perhaps one of the biggest drawcards of Hoi An is its delicious food. Ho Chi Minh City is the bustling southern Vietnamese City so full of energy it’s infectious. 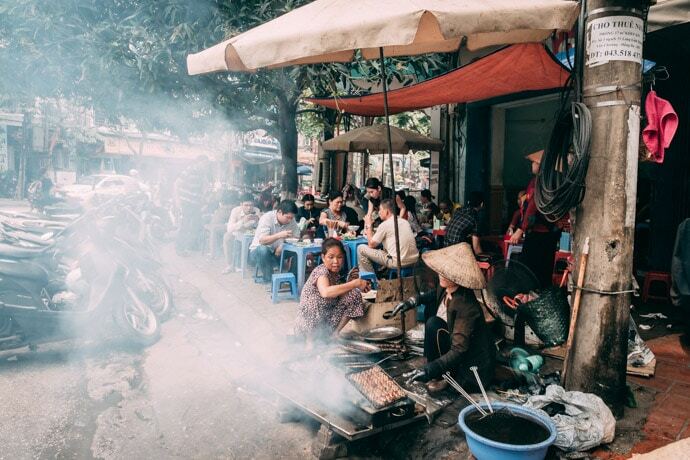 With streets full of motorbikes, so much history, street food stalls on every corner, amazing cafes and restaurants and also your base to explore the Mekong Delta and Cu Chi Tunnels. 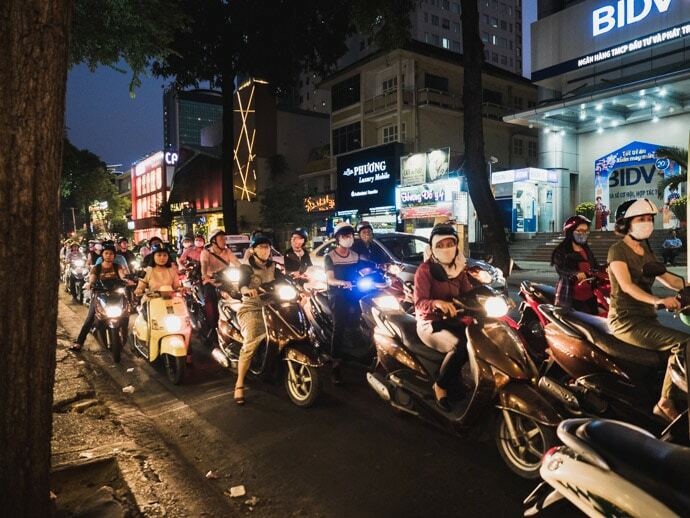 If you do one thing in Ho Chi Minh City, explore the city on the back of a scooter (we loved X.O Tours). 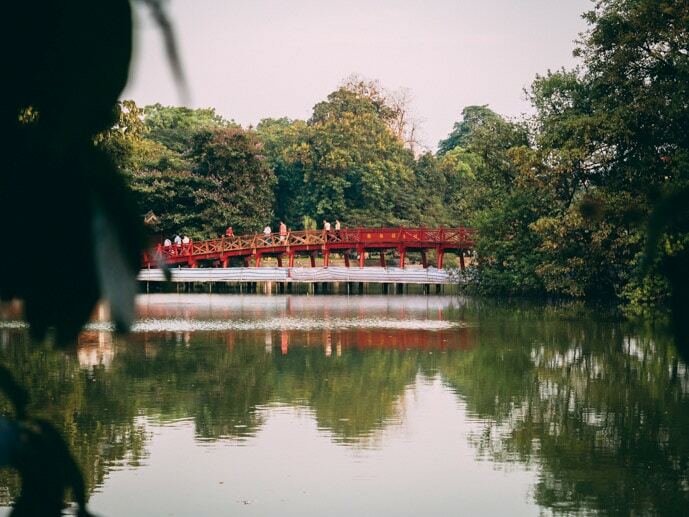 From Ho Chi Minh City you can take a day trip to the Mekong Delta, or if you have time, take a few days to explore this area alone and continue to Can Tho. 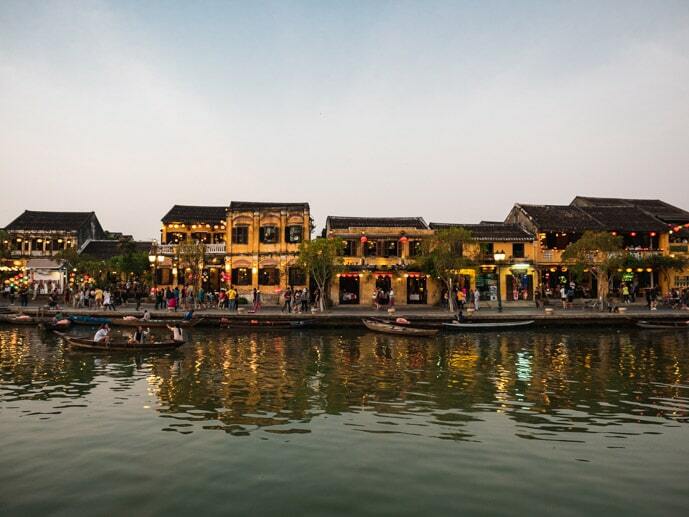 Take a boat trip down this vast network of rivers, see floating markets, local communities and a different way of living. 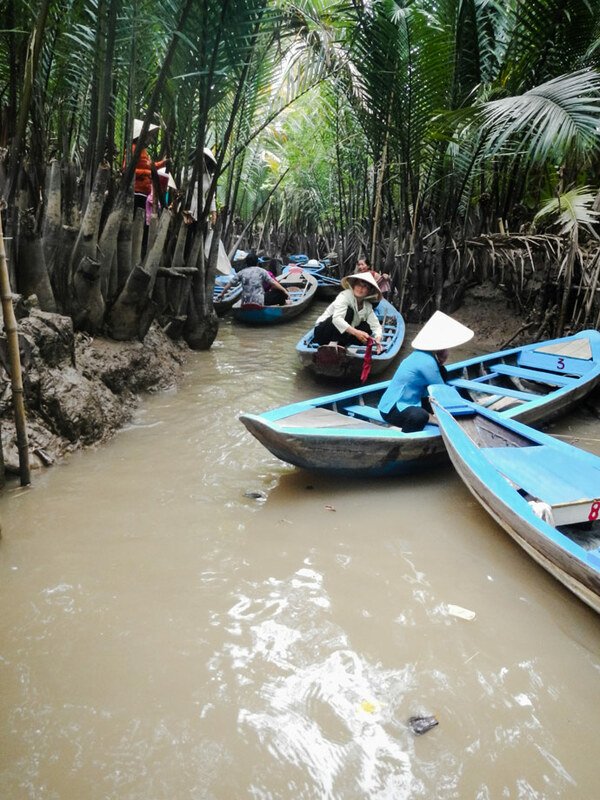 Hop onto a small wooden boat, a sampan, to explore the small canals. Definitely one of the most unique places to visit in Vietnam, albeit touristy in parts. Nha Trang is a coastal town located about halfway between Ho Chi Minh City and Hoi An. 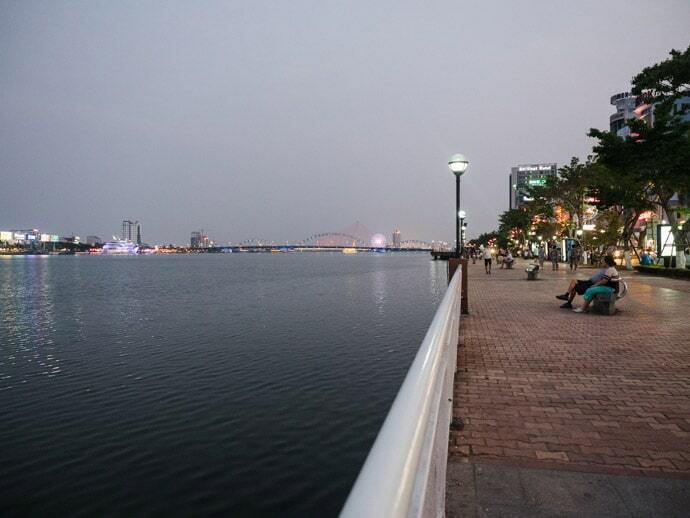 It’s a popular holiday spot with nice beaches, some beautiful hotels and resorts, seafood restaurants, and some great sites like Long Son Pagoda and Po Negar Cham Towers. 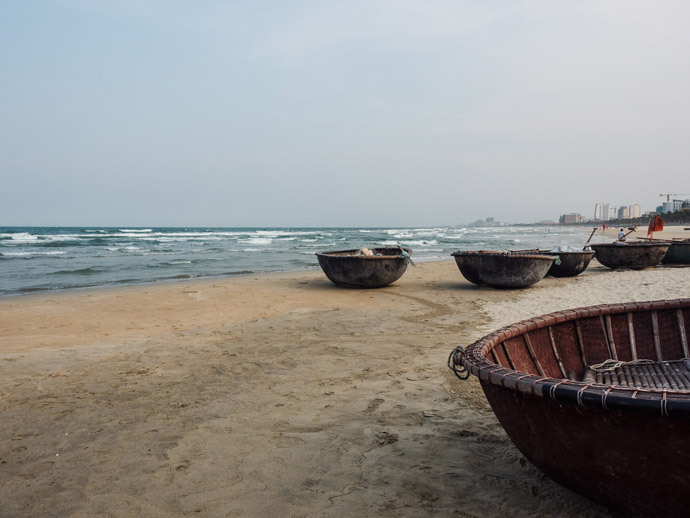 Da Nang is only about 40 minutes drive from beautiful Hoi An. 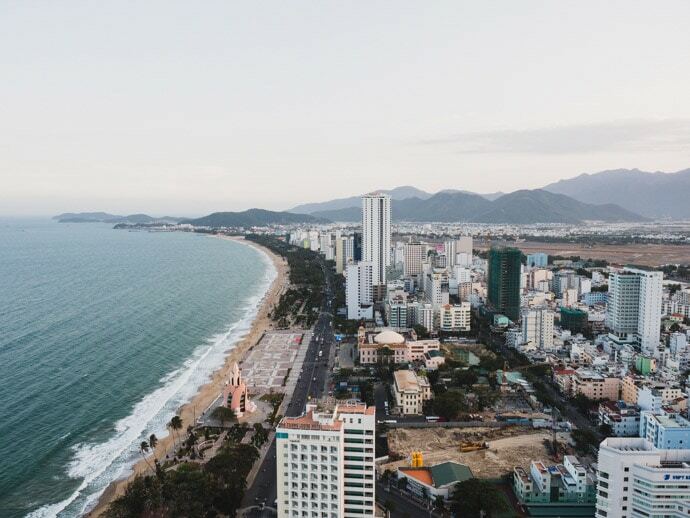 If you fly into Central Vietnam, Da Nang is where your journey will start. Or if you are travelling Vietnam by train, you will pass through here. Da Nang, perhaps rightly so, often gets overshadowed by Hoi An. If you only had time to do one of these places, I would always choose Hoi An. But that’s not saying that Da Nang isn’t worth your time, because it is. 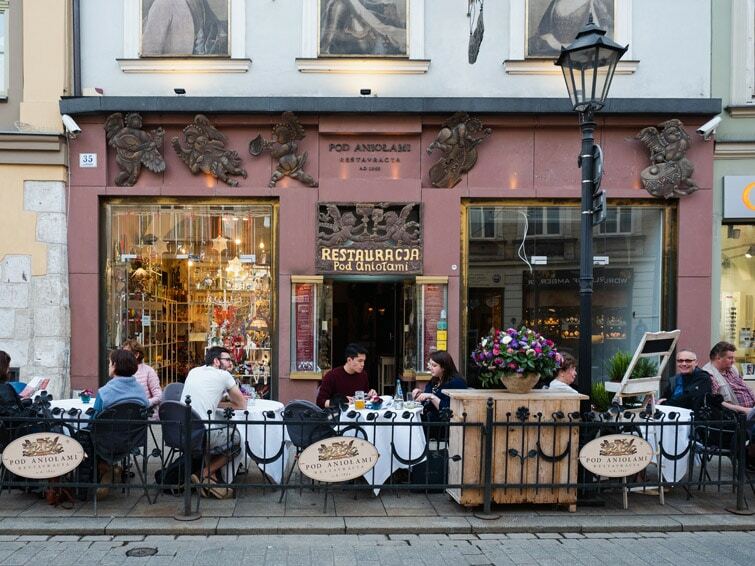 Here you will find fewer tourists (at least in the city, but maybe not by the beach) and get an authentic local feel. There are some great food options here too. And the beaches are beautiful. A highlight is exploring the Hàn Market. And from Da Nang you can explore areas like the Son Tra Peninsula and the Marble Mountains. It took us a couple of trips to Vietnam before we eventually made it to Huế. And we loved it. So if you have time on your first trip to Vietnam, definitely try to make it to Hue. 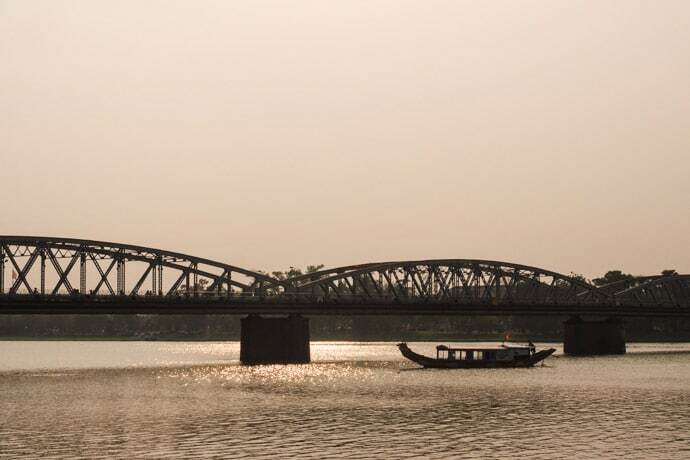 Hue can be reached by train from Da Nang in about 3 hours. It’s a stunning coastal train trip that follows a similar route to the Hai Van Pass. Hue was the capital from 1802 to 1945, when it was ruled by the Nguyen Dynasty. Here, one of the highlights is the Citadel and Imperial City. Hue is also home to some delicious regional dishes such as Bun Bo Hue and Banh Beo. 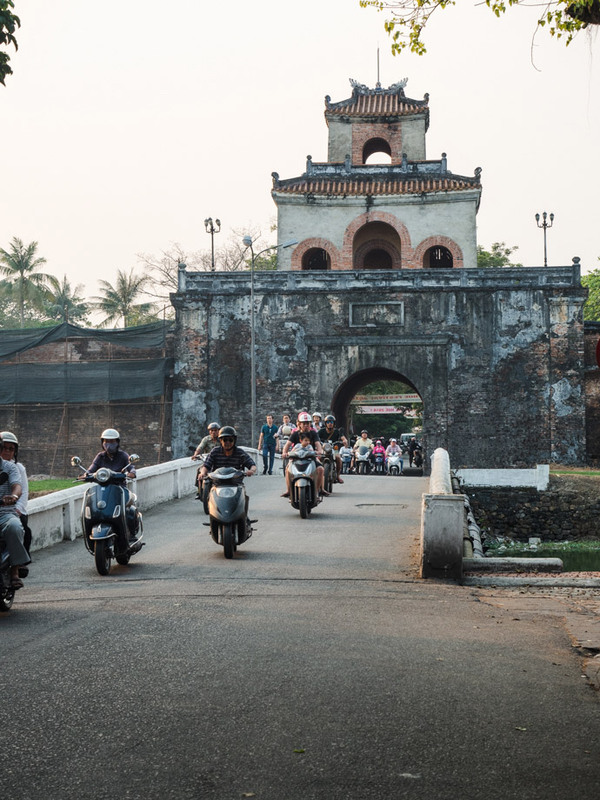 Hue is one of the best places to visit in Vietnam for history and food. Ninh Bình is a really special place and one of the best places to visit in Vietnam to see natural beauty and local life. It’s located in northern Vietnam, only 100 km away from Hanoi. 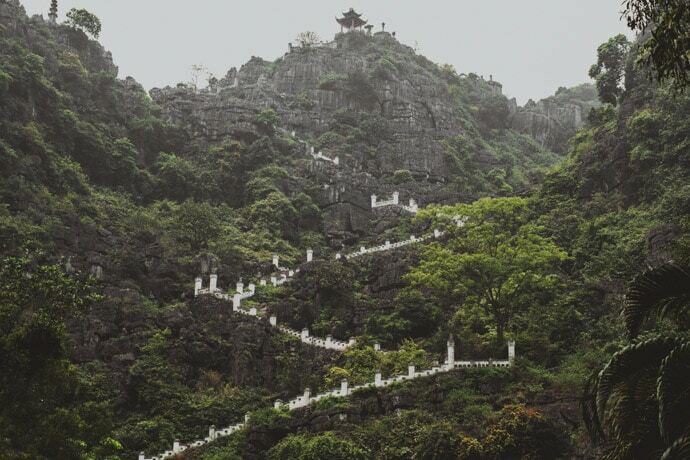 Visiting Ninh Binh is a great thing to do if travelling by train from Hue to Hanoi or vice versa. 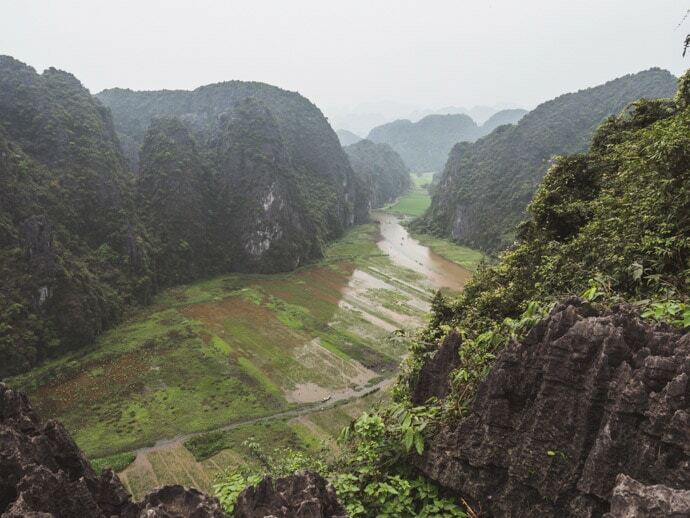 In Ninh Binh, you can ride bicycles or motorbikes around rural areas to explore. 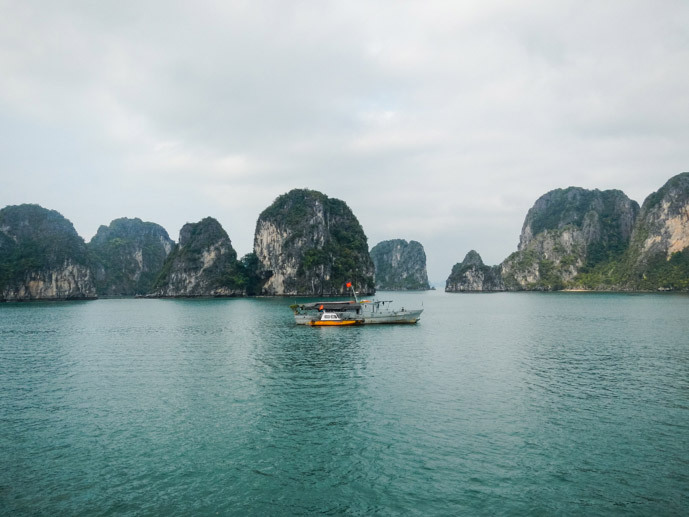 Go on boat rides through caves, see all the stunning karst limestone rock scenery, see the stunning views from Mua Caves, take a look at Bai Dinh Pagoda, and explore Hoa Lu Citadel, another ancient capital of Vietnam. The Capital City of Vietnam is definitely worth exploring. Even with its motorbike filled streets, you can still find a sense of calm by its tranquil lakes. Well, that’s if there’s not an energetic exercise group with music on loudspeaker there at the same time. 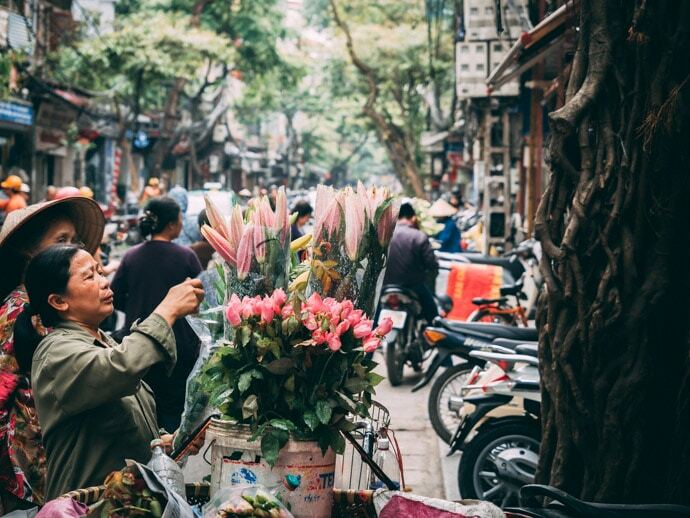 Spend hours exploring the tiny streets of Hanoi Old Quarter, visiting the many historical sites or even get up early and visit the buzzing flower markets. 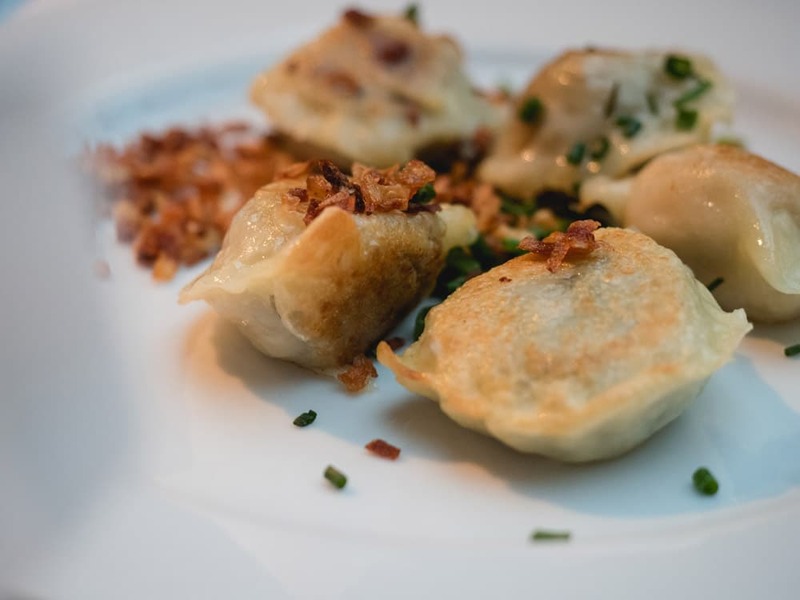 And as you may have come to expect in Vietnam, the food here is delicious, from Pho to Bun Cha. Hạ Long Bay immediately conjures up images of serene flat water and mist covered cliffs coming up out of the water. It really is a spectacular site. Ha Long Bay can be reached by car or bus in about 4 hours from Hanoi. Once you reach Ha Long Bay, you can explore it by boat, usually staying on board for one to four nights. The only downside to Ha Long Bay is that it has become extremely busy with many tourists and many boats now exploring the area. So if you are looking for some alternatives to Ha Long Bay, take a look at Bai Tu Long Bay or Lan Ha Bay. There are so many incredible places to visit in Vietnam, including ones we haven’t made it to yet but would love to visit. Here are some more stunning Vietnam destinations to consider visiting on your trip to Vietnam (for more information on these destinations see the Vietnam Tourism site). Sa Pa is a mountain town with hilltop tribes and beautiful rice terraces. Come here for trekking, culture and homestay experiences. Sa Pa can be reached by overnight train from Hanoi to Lao Cai (9 hours) and then a taxi or shuttle bus to Sa Pa.
Phú Quốc is a popular Vietnamese island with white sand beaches and resorts. It’s actually located just south of Cambodia and can be reached from Ho Chi Minh City in a one hour flight. Cao Bằng province is a region in Northern Vietnam with a UNESCO world heritage listed Geopark. It is a good base to explore nearby Ban Gioc Waterfall, which actually spreads over the Vietnam-Chinese border. You can reach Cao Bang from Hanoi on an 8-hour bus ride. Mũi Né is a coastal town in Southern Vietnam, about halfway between Ho Chi Minh City and Nha Trang. Here you can enjoy the beach, explore the fishing village, eat seafood and see the sand dunes. 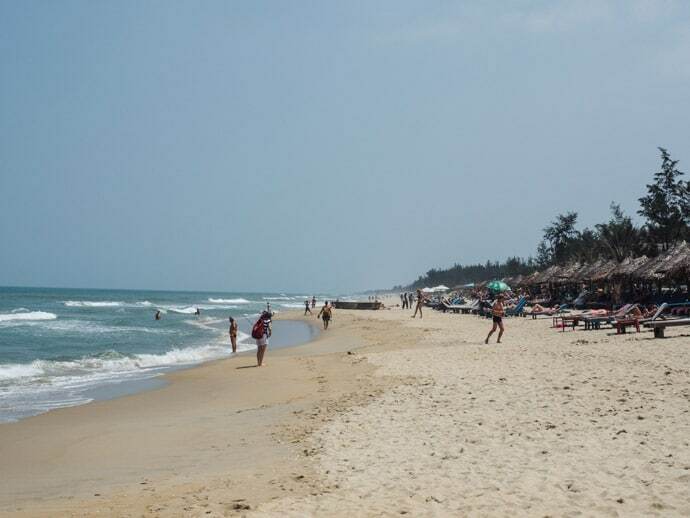 You can reach Mui Ne by bus from Ho Chi Minh City in 5 to 6 hours or take a train to Phan Thiet and a local bus or 15-minute taxi from there to Mui Ne. Đà Lạt is a hill town that was developed as a resort by the French in the early 1900s. Come here to relax, see some surrounding nature sights or take part in some outdoor adventure activities. About three hours away from Hanoi you will find the Mai Chau district. 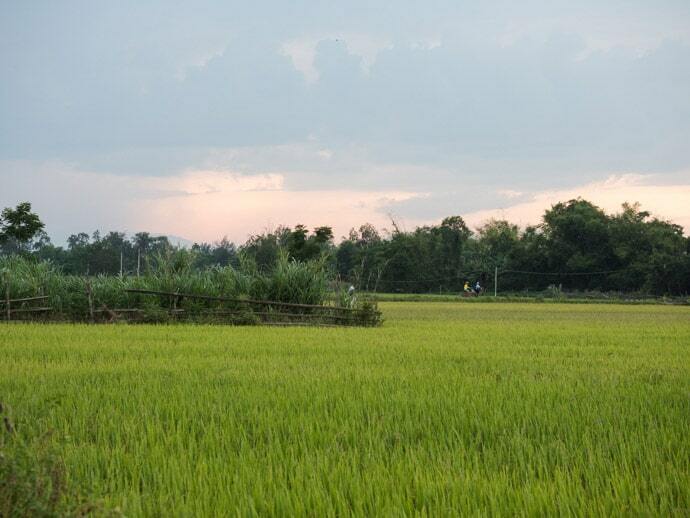 This is a rural scenic area where you can ride bicycles to explore its natural beauty, rice fields and local life. Phong Nha-Kẻ Bàng National Park is a UNESCO world heritage site and is home to the worlds largest cave. This area is known for its caves and karst mountains, being some of the oldest in Asia. It isn’t as easy to reach as some other areas in Vietnam but provides stunning natural beauty for those who make the trip. Hà Giang Province is located in Northern Vietnam, bordering China. It has some beautiful natural scenery such as rice terraces and mountains, and a great place for trekking. It’s still quite remote and best explored with your own transportation, in particular, by motorbike. But due to the mountainous roads, best left to experienced riders. The best time to visit Vietnam is largely based on its weather. Being such a long country, it depends on which region you are visiting, as the weather is quite different from Hanoi to Ho Chi Minh City. But for the best overall temperatures and weather, the best time to visit Vietnam is between January to April. For more information, see our Vietnam Travel Guide. What are your picks for the best places to visit in Vietnam?